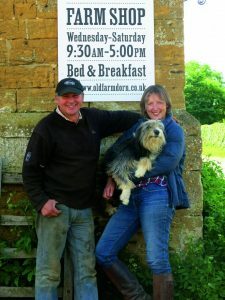 My husband Simon and I run a 300-acre mixed farm in the Cotswolds (www.oldfarmdorn.co.uk). We have sheep, cattle, pigs and hens, plus a small campsite, B&B and farm shop. We were lucky to be able to take over from Simon’s parents but do not own the farm ourselves – we rent the house and land. We both went to college to get qualifications in agriculture and had other jobs to get experience before we came to the farm. I love the way our job follows the seasons. We have a slow start in Jan/Feb to recover from the year before and, when it’s dark outside, we find inside jobs to do like catching up on paperwork. We have to be fit and ready for lambing in March, when we can be on call 24/7. Then the clocks change and, as the evenings get lighter, we spend more time on outside jobs – planting crops, making hay, combining. There is always something to do but there is something very satisfying in doing a job as basic as growing food for people to eat. The farm shop is open all year round but gets really busy in the run-up to Christmas and then we start again! There are some things out of our control but which have a great impact on our business. We need warmth and rain to make the crops grow, frost to help break up the ground and some good sunny days for haymaking and combining. Sometimes they don’t always come along at the right time so we are always checking the weather forecast. Commodities that we buy and sell like animal feed, oil and wheat go up and down in price, depending on what’s happening around the world – this can make a big difference to our income. We run a mixed farming business and need to be jacks of all trades. These are just some of the jobs we need to be able to do: animal care, accountant, combine driver, mechanic, customer care, plumber, builder, welder, staff management, decorator, chef, sausage maker, sheep shearer, commodity trader, hospitality, IT support, photographer, copywriter, publicist… Finally, you need to have lots of patience and a good sense of humour! 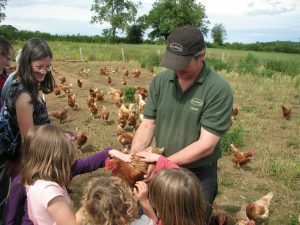 If you think that farming is for you, why not look out for weekend/holiday jobs at a local farm? See if you can find a farm for Year 10 work experience; join your local Young Farmers group (www.nfyfc.org.uk); find your nearest Agricultural College; go to www.farmsunday.org.